I would usually add screen grabs of the offending news articles HERE, but I am not. They are sickeningly inaccurate and offensive. But this post is referring to recent ludicrous press claims in several newspapers, of a non-existant 'cult of normal birth' by midwives, and that mothers and babies are suffering because of it. These stories are fear-mongering untruths, aimed at damaging a profession, and limiting women's autonomy and choice. And, they are adding to the fear amongst pregnant women, that already prevails. 1. There is no evidence whatsoever that a ‘cult of normal birth’ exists: indeed, less than half of women in the UK who could have a normal birth do so (40% as opposed to 80%), and nearly double the World Health Orgnaisation (WHO) recommended rate of 15% of Caesarean section (CS) are being done (over 26%) at a time when the whole world accepts that CS rates are too high, and that high rates risk harm to mothers and babies. 3. There is no evidence that there is an increase in incidences of perinatal asphyxia in the UK. 4. There is no evidence that normal birth per se (any more than any other mode of birth) is associated with baby deaths or damage. 5. The evidence we do have, from reviews of good quality randomised controlled trials, is that, if women have continuity of midwife led care, they are less likely to lose their babies (from early pregnancy to the early postnatal period, including birth), 24% less likely to have babies born prematurely, AND more likely to have a normal birth. WHO and many other responsible agencies around the world accept this evidence. 9. It is also unacceptable that our Secretary of State for Health, who is supposed to be concerned with reducing baby loss, has not challenged these deeply flawed claims, on the basis of the harm it may do to future mothers and their babies. All of these ethical principles seem to have been violated in the elements of the recent reporting that link normal birth as a systemic problem, and as the (only) factor in adverse outcomes in mothers and babies. It is clear that there are still some areas of poor practice which need to be addressed, but the outputs of recent quality assessments show that the majority of maternity care is excellent, including good collegiate relationships between midwives supporting women to have normal births, and obstetricians providing technical interventions where these are needed . Addressing poor quality care should not be at the cost of reducing this excellence. When midwives are broken - what can we do? It’s always a great pleasure to visit universities and meet enthusiastic student midwives. I also have the priviledge of speaking to scores of midwives at conferences and events. Social media is another way I connect with maternity workers, and I read blogs written by midwives about their work both in and out of the NHS. There are many heart soaring moments when I read about innovation, kindness, compassion and women centredness. But I am always alert to messages of distress, and when I hear accounts such as the one below, my heart well and truly sinks. I have written about the overwhelming and increasing pressures of being an NHS midwife, and midwifery manager, before. I have chosen to share this midwife’s plight for many reasons. Firstly because she asked me to, and because her words represent the feelings of all the others who write to me almost on a weekly basis. And of course I want to add to the lobbying for much needed change in maternity services; how can midwives care and nurture others when they feel stressed, burnt out, and unable to do their work? The situation is intolerable, and needs action. By using a pseudonym below, I am protecting a midwife’s identity. But many midwives speak out reveal their names, when they don’t feel able to continue. Others reach out to tabloids annonymously to highlight their distress, and recently the mother of a midwife contacted the press. In 2015, the RCM revealed that 50% of midwives in England were stressed. Julie is a newly qualified midwife, and like so many others, the NHS is in danger of loosing her. It's with much sadness and desperation, that at only four months into my midwifery career, I am going off sick for the first time with stress/burnout. Working conditions, despite generally very good support from colleagues and amazing support from my SOM, are untenable. I am completely heartbroken at my inability to give the kind of quality care women deserve due to staffing issues and chronic overworking. And this is despite my unit having some of the highest levels of positive feedback in the country. The price to be paid for this appears to be the health and wellbeing of all staff (particularly midwives and registrars). I'm sharing this with you as you have all been so supportive of my transition to life as a newly qualified midwife. And I believe it is an outrage that four months of work as a midwife is enough to break me, someone who has sought every strategy possible to engage in maintaining resilience (yoga, meditation, peer support, Twitter, reflecting, conferences, self-care, etc), whose passion and love for midwifery is so strong and who has made it their life's work to reach the point of qualification. I have thought about leaving midwifery. In fact, I have thought it almost daily for the past three months. I had no idea working clinically as a midwife would be so distressing. The most profound problem is that there is no time. No time to create meaningful relationships, to properly support people in their journeys, to hold space, to be tender. I have done my very best every shift and believe I have given everything I could have to the families I have been with but that is not the same as it being as good as they deserve. On the advice of my supervisor of midwives I'm going to my GP tomorrow to get signed off for two weeks. In this time I will be reviewing my finances to see how I can reduce my clinical hours as a midwife. As someone with a disability who already works 34.5 hours I don't know how I will survive financially. I may look for another part time job to make up the shortfall. My (retired) mother has spoken of giving me a monthly allowance. All this to enable me to practice midwifery. I am angry. I am angry for myself but I am angrier for the people we serve, that working conditions for midwives are so far from adequate and sustainable that they are unable to provide the care they deserve. If you have any ideas as to how to come back to the vocation I truly love and an identity that shapes who I am, in a way that is healthy and productive then I would be so grateful. And if you can, in any way, publicly share what I have told you (anonymously, as I fear being open may negatively impact me) then I beg of you to please do so. Tell everybody what is happening. That conditions are now so bad they are beyond normal newly qualified midwife transition. That we are experiencing burnout in months. My unit is struggling to retain even the most committed staff. We are demoralised. Not by the wonderful women and families, not by our colleagues, but by the inability to provide truly compassionate, individualised, safe, holistic care and support. The 'workload' is relentless and the only thing left to give is ourselves. And I am broken. Please share my story if you can. It's reassuring to know I'm not the only one struggling! I really feel that the public deserve to know the real state of affairs. There seems to be an expectation for midwives to be virtuous and perfect (a mother-type complex? ), able to carry all burdens without complaint, ever grateful for the 'privilege' and 'joy' of the job. That is not to say midwifery work is without these elements but I do not feel 'privileged' on most shifts! The stress is too great to even appreciate the beauty and wonder that exist. I live with a fellow (non-disabled) NQM, who is on the verge of breakdown too and she has had two two-week long absences from work from physical illnesses she attributes to internalised stress. Again, this is within a four month period of working clinically. I just wanted to let you know as it does affect my ability to earn extra income by managing the potential work-load of another part-time job in order to facilitate reduced clinical hours as a midwife and thus it makes me intensely financially vulnerable (I am 30, live independently with a housemate and all the associated costs). This on top of the stress of working in a busy, high risk obstetric unit with chronic understaffing, demoralised midwives and unmanageable workloads is just horrible. However, to temper this I would like to add that the labour ward co-ordinators, my incredible SOM and colleagues are doing their very best on a daily basis to support me and everyone else, however there is nothing they can do about the staffing and workload issues which underpin everything. Thank you for taking time out to listen to me. I feel heard and understood which is so lovely in these trying times. If you have any ideas as to how to come back to the vocation I truly love and an identity that shapes who I am, in a way that is healthy and productive then I would be so grateful. And if you can, in any way, publicly share what I have told you (anonymously, as I fear being open may negatively impact me) then I beg of you to please do so. Tell everybody what is happening. That conditions are now so bad they are beyond normal NQM transition. That we are experiencing burnout in months. My unit is struggling to retain even the most committed staff. We are demoralised. Not by the wonderful women and families, not by our colleagues, but by the inability to provide truly compassionate, individualised, safe, holistic care and support. The 'workload' is relentless and the only thing left to give is ourselves. And I am broken. Please share my story if you can. WE ARE SHORT OF MIDWIVES, especially in England. The RCM’s calculation is that England needs 2,600 more midwives. The proposed NHS savings of £22bn by 2020 isn’t going to happen unless we work in different ways, and become more innovative and dexterous. The Better Births report tells us this too, and provides some solutions to improving the working lives of maternity care workers, by supporting the development of new models of care, increasing choice of place of birth, and proposing the exploration of no fault compensation. Meet regularly with your staff, seek opinion on pressures within your services, then lobby for change using quantitative and qualitative data, and benchmarking tools such as BirthRate Plus? Establish schedule of meeting with student midwives and newly qualified midwives? Their views will reflect the culture of your services. Know if your service offers women the full choice offer of place of birth, which gives midwives the opportunity to experience and use their full range of midwifery skills? Monitor your services’ continuity of midwifery care (r) levels, which evidence tells us improves outcomes and experience for mothers, and increases midwives job satisfaction? Carry in-depth analysis of sickness episodes/levels? Obtain regular feedback from service users via MSLCs or other forums, and frequent audit of views? Work closely with RCM and other union reps to seek opinion on working conditions and job satisfaction, and to share knowledge of your service? Rewarding staff and showing appreciation, such as organising a celebration event where staff nominate peers is a great way of lifting morale, and increasing motivation. Look after yourself. You are your greatest asset, and listening to your body and mind then acting on signs of stress are crucial. Talk to someone you admire and trust, and ask for their guidance. This may be your supervisor of midwives, or a member of your team. Stay close to your positive role models. Network with wider groups, such as closed Facebook groups, and seek positive support from others via social media sites such as Twitter. Read this Hannah Dahlen paper which highlights the importance of identifying real and manufactured fear. Read Chapter 17 in The Roar Behind the Silence – entitled Caring for Ourselves: the key to resilience by Hunter and Warren. The Roar Behind the Silence: why kindness, compassion and respect matter in maternity care – has many examples and ideas for change in maternity care, for all levels. We try to carry on the work we do with our student midwives into the NQM phase. I personally visit each clinical area every morning and talk to all staff. It is important to learn the names of new before they start working, to say ‘Hello’ and call them by name from day one. I speak to them during preceptorship at their formal programme, and advise them that I have an open door as do the matrons. It is vital to check their well being to empower and support them. If we have an incident involving a NQM we try to wrap our arms around them to support, reassure and guide because we really can't afford to loose these amazing midwives who are the future of midwifery. I know. I agree. I have shed too many tears over a career I could not love more because there is nothing I can do. What he didn't know was that heartbreakingly this is a daily occurrence in my life as a midwife. What he didn't know was that actually yesterday was a rare Saturday off for me yet I had come into work so that my amazing colleagues could have a break from their 13 hour shift. A break they won't be paid for whether they take it or not, but that they physically need as human beings. I had come into the unit so that women like his daughter could be seen. So that our unit could be open to women who needed our skills as midwives, doctors, health care professionals. Women who were in labour. Women who's babies weren't moving much. Women who were concerned about their own wellbeing. 5 maternity units in the North West of England have been closed over the weekend. These women need our care. We are literally being worked to the ground. I am watching amazing midwives leave a profession they love because the workload and stress is too high. Today is a rare Sunday off for me. But I will be spending it supporting our rights as workers. The NHS is run on good will. But there is only so much we can take. We joke at work that midwives don't need to eat. To rehydrate. To empty our bladders. To sleep. Let us look after ourselves so that we can look after our women. Our future generation of children. Earlier this year, our country voted for a government that said no to more midwives. The Conservative party have demonstrated five years of austerity, falling living standards, pay freezes and huge cuts to public services. They have threatened to make cuts to our night shift and weekend enhancements. Over the past 4 years I have missed Christmas days. New Years days. Family's birthdays. Countless nights out. I had a good education and did very well at school. I am 22. I have held the hands of women through the most emotional times of their lives. I have dressed angels we have had to say goodbye too. I have supported women to make decisions that empower them. I have been scared myself. Tired, stressed, emotional every day. Yet I am not and will not be paid well like my friends who have chosen business careers. I am not offered pay rises for my efforts or successes. I don't care because I get something more valuable than that from what I do. I love what I do. I'm passionate about what I do that's why I do it. But I do care that we are the ones who are being threatened with further cuts. Further strain. I have shed too many tears over a career I love. Missed too many meal breaks. Not physically been able to care for too many women the way I wanted to. Spent too many days off in work. Lost too much sleep over the stress I am under. Watched more of my colleagues than I could count (myself included) be signed off work with stress in the early years of their career. Watched too many good midwives leave careers they love. This is not humane. Please let's end this. Protect your NHS. Your children's future. You're education system. The core foundations of Great Britain. I have recently learned the world is a selfish place. But I have also learned that there are a lot of very good people in it. The NHS is run on good will and because of this we have been pushed too far. It's been a while since I started using Twitter. It was my daughter, @acbmidwife who first stirred my interest. I don't know how it all happened, but now most of my days involve 'tweeting' or 'chirping', and the result is I am increasingly connected with like minded folks across the globe. Not only am I in touch with inspirational leaders from nursing and midwifery, but NHS CEO's such as Lisa Rodrigues @LisaSaysThis and Mark Newbold @drmarknewbold always have great information to share. I communicate with local GPs, and Stuart Berry @StuartBerry1 is one of them. Stuart and I have never met, but we have some similar interest and can promote each others' work through Twitter channels. Amazing. Interestingly, Stuart posted this about the use of Twitter this morning. Great stuff! There isn't a week goes by when I'm not contacted by individuals asking me for help and support, or inviting me to speak at study days an other events. I am particularly happy with this, as it helps me to share expertise gained by working in the NHS for 35 years. Last week was a particularly busy week, and almost everything that I did was either initiated or organised via Twitter! I happened to be in London, for some 'away time' with the Trustees of the Iolanthe Midwifery Trust on Saturday...and then the fun started. I then scurried to St Pancras to meet Murray Chick (yes that's his real name). Murray is the owner and brainchild of Britain's Nurses, and I LOVE the site. Again, this opportunity was made via Twitter, I found the site there, and made some enquiries. Incredibly easy, and so effective! Previous to this meeting, and through Twitter, @Britainsnurses picked up two of my blogs to share with nurses for International Nurses Day! Sorry about that @gbutcher17! The day after I went to Kings College London again to meet a group of wonderfully enthusiastic and very smily positive student midwives, organised via Twitter following a lovely invite by student midwife Natalie Buschman @Birthsandmore. It wasn't the first time Natalie and I connected and made a plan via Twitter; she also took up the challenge to do the Prudential Ride London, in aid of the Iolanthe Midwifery Trust, after seeing me advertise the opportunity on Twitter! Great work Natalie! If you want to sponsor Natalie, and thereby support the Iolanthe Midwifery Trust, you can do so here! 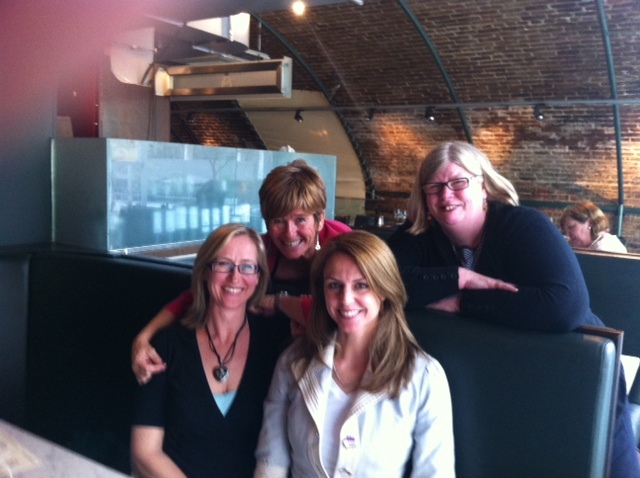 After being with the students I ran round the corner to enjoy lunch with three formidably inspirational women: Maggie Howell @MaggieHowell from Natal Hypnotherapy , Independent Midwife extraordinaire Pam Wild @Pamoneuk and journalist Beverley Turner @BeverleyTurner . What a treat. Again...lot's to chat about and plan in limited time...and it all started with Twitter! And then a couple of weeks ago Dean Beaumont @DaddyNatal from Daddy Natal, invited me to review his book...'The Expectant Dad's Handbook' on Twitter. We exchanged contact details through the direct message function, and voila! The book plopped through my letterbox and was avidly devoured within a few days. The book, by the way, is spot on. Sensible and sensitive...with great advice for all Dads-to be. I will be writing a review Dean! I have the feeling that my Twitter support of StudentMidwife.Net went some way to their decision to invite me to be their Patron. Whoop! What a privilege and an opportunity. Also, through Twitter I saw an chance to be involved with @WeNurses, by running regular @WeMidwives chats...which has been a steep learning curve! This has really given a new voice to Midwifery. And then there's the fabulous Doulas. I 'met' many of them through Twitter, and we connect so regularly I feel like I know some of them well, even though I have never seen them in person. There are too many Doula friends to mention here, but you know who you are! (I'll probably cause offence if I miss anyone out!). Through Twitter, I have come to know and appreciate your valuable contribution to childbirth. Student Midwife @Li33ieBee said -'Via Twitter I have had articles proofread by experts and been sent hard to find research papers'. But there aren't many midwives using Twitter, and there are still a considerable number of individuals and organisations that are fearful of using social media. I know that several health professionals have lost their jobs or places at University, due to inappropriate postings. But this is a pity. There's lots of guidance out there, and with common sense you really can avoid the pitfalls. For me, Twitter brings fabulous worthwhile interactions with others, the sharing of current and interesting news or information, and unique and exciting opportunities. And every now and then, there'll be a gem that pops up, such as Molly Case's inspirational poem, read by her at the RCN Congress 2013. So, last night I asked several student midwives who are already engaged with Twitter, what benefits they felt it brought them...and here are a few of their 'tweet responses' back to me! @Beetrooter- 'Twitter brings fellowship with ppl passionate about midwifery from across the world & across spectrum of professional roles. Its my inspiration for learning, gives evidence to inform my practice, rolemodels for me to aspire. Instant access to womens' experience jubilant/ anguish. Twitter is conversations. It's life squished beautifully into 140 characters'. 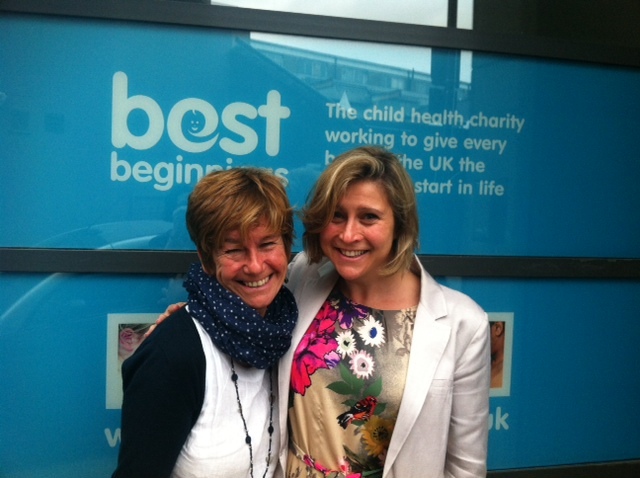 @Birthsandmore -'great way to broaden mind, horizon and tweet with like minded people you otherwise would not have met. t lifts my spirit to read and hear from so many passionate people, especially after a tough day 'at the office'! @sazzletastic-People on twitter have been an amazing support to me throughout my 3rd yr studying giving me encouragement and reassurance to keep going and have confidence in my knowledge and abilities. Having access to organisations and big names in the field that actually reply to you is brilliant! I've learnt so much via twitter, I only wish I'd had it for the first 2yrs of study too! Twitter is the thread that binds me across the globe, weaving me into the fabric of international midwifery & making me a piece of the puzzle that builds up a global voice, I am an equal part of that voice. Ever changing and pushing myself to grow with a community of individuals who share my philosophy and question practice. Twitter shines a light on every end of the spectrum. United we stand on our virtual platform- Speaking up and stepping forward, one tweet at a time'. Tonight the debate centred around the shortage of midwives in the UK, and the impact this has on mothers and babies. The participants in the chat were raring to go. Interestingly but not surprising the majority of tweeters were student midwives, and they carefully and articulately described the situation in today's NHS maternity services. I believe that the content of the chat found here is a true reflection of things, as I hear from my colleagues around the country on a daily basis. We must keep raising the issue that radical change is needed to ensure care at the very beginning of life is the best it can be. Midwifery staffing levels are inadequate, and the workload is increasing for many reasons. I recently wrote a post for the NHS Confederation's blog for NHS Leaders highlighting the need to take stock of the Francis Report's recommendations and to listen to what service users are telling us, before it's too late. The students involved in the chat tonight were insightful, sensible and sensitive. They see and feel the pressure, the tension, the joy and the tiredness. They want to change things, and why shouldn't they get the opportunity? They are the future. It's a long time ago since I was a student midwife (1970's), we were then known as a pupil midwives. It's even a long time since my daughter was a student midwife...and that does make me feel old! 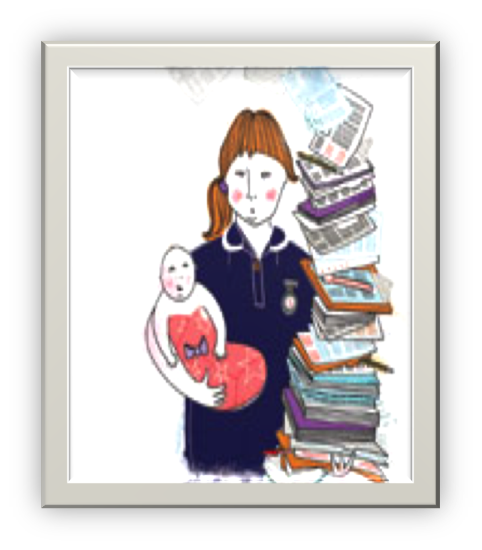 I have worked very closely with so many incredible students throughout my career, and I have instantly recognised the ones who I felt 'had it'- that is, the sensitivity and kindness that makes a difference to childbearing women in their most vulnerable yet special moments of their life. But during the past year I have been incredibly fortunate to have 'met' hundreds of students from throughout the UK and beyond, in the virtual world. This has been made possible because of two things: writing my midwifery memoir Catching Babies, and using Twitter. So what is it that makes me feel proud? From my experience I feel this new generation of student midwives have not only 'got it', but they have other attributes that really impress me. I have seen a confidence and maturity that enables them to express themselves respectfully, with humility and graciousness. But this assertiveness is not at the cost of kindness and compassion; this is in abundance, along with an enormous passion to make a difference to women and families during the childbirth period. My belief was further consolidated on the 16th July when several student midwives dressed in 1950's Call the Midwife style uniforms cycled 6 miles through London raising awareness of the desperate need for 5000 more midwives and the petition that the Royal College of Midwives have organised. The event was organised by Rebecca Ashley, and she and her colleagues have demonstrated courage and determination, innovation and leadership and they are still in their first year. We (midwives) are eternally grateful to them. The more I communicate with, see, hear and chat to our country's student midwives, the more my heart sings. We are incredibly fortunate, and the future health of our nation depends on their ability to say strong, positive and focused. It was a bit of a rush for me this morning to get to Preston, but after collecting Olivia's home baked ginger biscuits and picking up Anita on route....we arrived heavily laden with cakes and books all ready to go! My daughter Anna is a midwifery lecturer at UCLan and with her colleagues and some student midwives has been planning and working hard to prepare the wares to sell for this important event. Anna's dear friend, the lovely Carys who works as a midwife at Wythenshawe had made chutney, marmalade and jam, all labelled 'made by midwives'. Her mum had knitted some toys, made hearts and other things to sell. A midwife from Preston made some very special handmade cards (I bought six!). I sold signed copies of my book Catching Babies, and the profit went to the charity. We also sold wonderfully crafted recipe books, created by an amazing Scottish midwife, Linda McDonald. I met Linda in Troon, where she explained the MUM's project to me. Basically, Linda has developed three recipe books and the income generated from the sales goes to help develop maternity services in Malawi. Sarah Brown and Davina McCall have written forwards for the books, they are so impressed with Linda's work. So we had lots to sell, and everyone worked hard to encourage cake buying! £600 was raised on the stall alone in four hours, and there was lots of discussion from the 'customers' about birth and health....thus raising the profile of the role of the midwife. A sponsored walk when the stall was emptied has raised more much needed money, and donations are still being taken! Congratulations to everyone for such a massive effort. Your time and energy will be someone's improved maternity care. You couldn't ask for more.